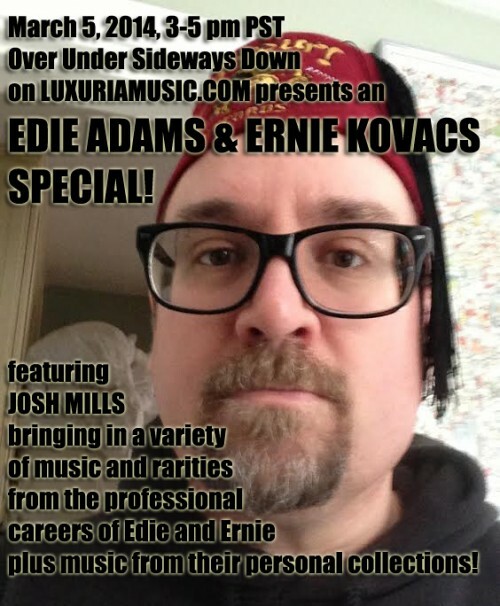 Tune in to this week’s episode of Over Under Sideways Down on LuxuriaMusic.com with your host Lee Joseph – for an Edie Adams and Ernie Kovacs special with guest Josh Mills! Josh Mills, who runs the estate of his mother Edie Adams (www.edieadams.com) as well as that of Ernie Kovacs (www.erniekovacs.com) will be bringing in a variety of music from both the professional careers of Edie and Ernie but also music from their personal collection. This will include Kovacs comedy albums to Edie’s out-of-print LPs from the 1950’s and ‘60s. Selections will include music/comedy from The Ernie Kovacs Record Collection (Columbia 1977), Percy Dovetonsils….Thpeaks (Omnivore 2012), The Charming Miss Edie Adams (1959), Edie Adams Sings?….Music to Listen to Records By (arranged by Henry Mancini, MGM 1959), Showtime on Broadway (Columbia 1964), The Charming Miss Edie Adams (RKO, 1959), It’s A Mad, Mad, Mad, Mad World and more. Plus, Josh will be brining rare vinyl from the personal collection of Edie and Ernie selecting tracks that were either prominently featured on their shows, artists who appeared on their shows or the actual records from those shows.